The horse and mule plow teams, antique tractors, artists and crafters, exhibitors and an assortment of family activities will be at Homeplace on Green River for the annual plow day/spring festival Saturday, April 27. This will be the 9th year for the spring festival at Homeplace. The first spring festival at Homeplace in 2012 drew 900 people. In subsequent years, the annual spring festival has grown. Last year an estimated 2,500 attended and if the weather cooperates, this coming festival should exceed that number. That first spring festival was the result of an invitation to host the well-established tractor show that was first organized in 1997 by Adair Countian Lewis Garrison. The tractor show was held each year at Mr. Garrisons farm, but its success made it hard to host so many people and tractors. When Mr. Garrison asked if Homeplace would host the show Homeplace Board enthusiastically agreed, and the spring fest at Homeplace joined the long-established fall heritage festival. But by 2015 there were fewer tractors, and the board decided to replace the tractor show with a plow day, and that year twelve horse and mule teams demonstrated their plowing skills while families enjoyed a variety of early Kentucky farm demonstrations, family activities, Kentucky made arts and crafts and good food. This year there will be more artists and crafters, more folks demonstrating farm and early Kentucky crafts and skills, more exhibitors, more food vendors and, no doubt, more families enjoying the festival. Three years ago, the tractors came back to join the plow teams and other festival activities. There were 14 horse and mule plow teams last year and double that number plan to be there for this year’s festival. There will also be a large contingent of antique tractors. Last year there were 20, this year more are expected. There will be Kentucky arts and crafts and a variety of food items. In year’s pasts, the line was long for the kiddie barrel train so this year there will be two barrel trains. There will be face painting, Native American arts, colonial reenactors, hay rides, sheep shearing, pottery making, horseshoeing and opportunities to see what life was like on the farm many years ago. At least 20 folks will be demonstrating their skill in everything from butter-making to horseshoeing. At least 27 Kentucky artists and crafters will be showing and selling their work and nine food vendors will be selling tenderloin, pulled pork, fish and other sandwiches, ice cream, cotton candy and other goodies. There will be hayrides, a petting zoo, two barrel trains for the youngsters and live music will be keeping the show barn lively with the music of the Exie Boys, Renetta and Friends, Retro Faith Gospel, Killin’ Time and Leah Hayes and Benson Sexton. ​ For list of Plow Day activities, click here: 2019 Plow Day Spring Fest list of activities. Both Smoke on the Mountain and the fish dinner served prior to the show were highly praised by the 200 persons who attended during the two shows this past summer and the Homeplace Board is pleased that Lindsey Wilson Director of Theater offered to bring the show and fish fry back May 15. It’s a spirited show, and the audience laughed and sang along with the cast. Smoke on the Mountain takes place on a Saturday night in June 1938 in the sanctuary of the Mount Pleasant Church in Mount Pleasant, North Carolina. The Sanders Family Singers are performing for the first time after a five-year hiatus from the gospel-singing circuit. The family of six have more than their share of testimonials to share with audience. It's a respectable musical comedy that is one of the most often produced shows world-wide. The play is directed by Lindsey Wilson College’s Assistant Professor of Theater Robert Brock with music direction by Associate Artistic Director Jeremy Cloyd. The performers are students from Lindsey Wilson’s theater program and local residents. Space is limited so make your reservations early by calling or e-mailing Phil Hanna at (270) 384-2894 or cphanna51@msn.com. Tickets for for Smoke on the Mountain are $20 for the show and fish dinner or $10 for just the show. The Homeplace Board hopes to bring Professor Brock back for a repeat performance in 2020. Beginning this summer, Homeplace on Green River will establish a pro­tected seedling nursery of the functionally extinct American Chestnut tree. Volunteers will monitor and care for the seedlings until they mature to where they can be disbursed. The project will be supervised by the Ken­tucky chapter of the American Chestnut Foundation. Before the early 1900’s, the American Chestnut was the queen of Kentucky’s woodlands. It dominated America’s eastern forests. Because it could grow rapidly and attain huge size, the tree was often the outstanding visual feature in both urban and rural landscapes. The wood was used wherever strength and rot-resistance were needed. The 1800s log pen barn at Homeplace reconstructed at Homeplace is predominantly well preserved American Chestnut logs harvested in the early 1800s. In addi­tion to the log barn, American Chestnut lumber was used in much of the original construction of the Homeplace bank barn built in the mid-1860s. three to four billion trees prospered across more than 300 million acres. Known as “redwoods of the east,” chestnuts grew fast and big and lived long, many reaching more than 100 feet in height, with diameters exceed­ing 12 feet, and living up to three centuries. The American Chestnut’s edible nut was also a significant contributor to the rural economy. Hogs and cattle were often fattened for market or consumption by allowing them to forage in chestnut-dominated forests. There is no doubt the early domestic animals at Homeplace feasted on chestnuts. Chestnut ripening coincided with the Thanksgiving-Christmas holiday season. “Chestnuts roasting on an open fire” were common all winter long. Turn of the century newspaper articles showed railroad cars overflowing with chestnuts rolling into ma­jor cities to be sold fresh or roasted. The American Chestnut is truly a heritage tree. All of this began to change about the turn of the nineteenth century with the introduction of chestnut blight. This disease reduced the American chestnut from its position as the dominant tree species in the eastern forest ecosystem to little more than an early-succession-stage shrub. There has been essentially no newly harvested chestnut lumber sold in the U.S for a century, and the bulk of the annual 20-million-pound nut crop now comes from introduced chestnut species or imported nuts. Today, more than 100 years after the blight forced it into near extinction; scientists are resurrecting the once-great tree. Homeplace has been selected as one of the places to advance the effort to bring this beautiful and useful tree back to Kentucky’s forests. Only a few isolated trees are still standing in Kentucky. One is in Adair County; its location protected. It is designated a “mother tree” because it continues to produce highly blight-resistant viable seeds which are harvested and replanted in selected protected environments. Despite its decimation as a lumber and nut crop species, the American Chestnut is technically not extinct. It is, however, considered functionally extinct by the U. S. Department of Agriculture because the blight does not kill the tree's root system. The American chestnut has survived by sending up stump and root sprouts that grow vigorously in the woodlands understory and inevitably succumb to the blight and die back to ground level. ​Many of these stump sprouts will be dug up across southcentral Kentucky and moved to the mother tree nurse­ry at Homeplace where they will be nurtured through attacks from the blight. When they begin flowering, about five or six years after planting at Homeplace, the blooms will be bagged to prevent natural pollination. Pollen from blight-resistant chestnut trees will be used to pollinate our mother trees. This process will produce seeds which will be planted to produce seedlings. If all goes well, at least 50% of these first generation seed­lings will be fully resistant to the blight and will produce trees that will be a significant step toward returning these queens of Kentucky’s forests. The information for this article was compiled for multiple sources including the American Chestnut Foundation. The photo of the towering American Chestnut tree is courtesy of the U.S.Department of Agriculture. ​Homeplace on G​reen River Fall Heritage Family Festival turned out a large crowd in spite of threatening weather. About 1800 people paid $10 per car to enjoy the all-day live music in the barn, exhibits and demonstrations, rides, arts and craft vendor and good food. The strong new additions this year, added to many of the favorite activities returning, some who have been part of the festival for all of its 11-year run, met the high expectations. Headlining the new activitiesr was Kay Gschwind and Ben Burgess with their Suffolk Punch draft horses demonstrating how logging was accomplished prior to tractors and log skidders. There was several new artists and crafters, exhibitors and food vendors. Two new music groups, students from the Burkesville Academy of Fine Arts, and the Unity of Praise Youth Choir from Taylor County’s Pleasant Union Baptist Church were part of the all-day live music show in the barn. They joined The Exie Boys, frequent performers of bluegrass and CW at Homeplace Festivals, and Renetta and Friends, who performed a variety of music at both the spring and fall festivals last year. Both groups drew large crowds of listeners. ​Mountain, drew a crowd of more than 100 June 30 despite the record heat. About 45 people attended The Two Gentlemen of Verona. The Two Gentlemen of Verona is a romantic comedy that follows the friendship of two men, Valentine and Proteus, who are parting ways. Valentine moves to Milan to better himself by employment with the Duke of Milan, while Proteus stays in Verona to be with his love, Julia. The men are reunited when Proteus is sent by his father to the Duke’s court in Milan. Both men fall for the Duke’s daughter, Silvia. Will their friendship be put to the test? Will either man end up with their one true love? “This play gives a serious message of forgiveness.” Says Robert Brock, director of theater at Lindsey Wilson College. Brock, who directed the performance, decided to place this particular production of Two Gentlemen of Verona in the time of cowboys. Instead of Verona and Milan, the audience is taken to Texas and Mexico. By setting the play this way, Brock feels “it added to the humor already in the script,” and, "The personal struggle between the two men and the different cultures they must overcome makes this play the perfect catalyst for the western setting." ​In 2016, Jessica Clark, at that time a freshmen at Green County High School, volunteered to work as one of the students on the soil health project being conducted by Homeplace on Green River. That year, and every year since, she has assisted in the collection of soil samples from the experimental field as well as analyzing the data from those samples. In 2017 Jessica compiled the data into a poster and research paper and entered it into the Agriscience Fair at the Kentucky Future Farmers of America (FFA) Convention. Although the project did not place, Jessica received many valuable pointers. In 2018 Jessica presented the project once again in the Agriscience Fair at the Western Kentucky University FFA/4-H Field Day where it placed first. The following week the project brought home fifth place at University of Kentucky FFA/4-H Field Day. Jessica then updated her project with 2018 soil test information and went to the Kentucky FFA Convention Agriscience Fair in June where she won the Plant Systems Division 5 contest. Her research paper will now be sent to National FFA where the top 12 papers in the nation will be announced as finalists and allowed to compete at the national level in October. Jessica is a senior at Green County High School.. She serves as president of the GCHS FAA. She plans are to attend Western Kentucky University and major in agribusiness. ​The soil sampling project at Homeplace is part of a broader effort at the farm to help improve soil quality and increase the natural health of soil. This can be done by wise use of cover crops and other techniques to preserve the beneficial bacteria that encourage plant life and discourage destructive insects thus reducing the use of pesticides. There were lots of “whoas,” “gees” and “haws” at the Homeplace on Green River at the April 21 plow day/spring festival. "Whoa, look at that,” “Gee, I’ve never seen one of those before,” and “Haw! See I told you the kids would have a ball here.” And, of course, occasional commands for the 15 horse and mule plow teams, too. A record crowd of about 2,500 people enjoyed the fine weather and many activities at the plow day/festival. The previous record, an estimated 2,000, was set at last September’s fall heritage festival. It’s difficult to determine an exact count because people are constantly coming and going all day. There were about 800 cars and the parking areas were full. There were also about 30 antique tractors thanks to of Eddie Cowherd and Wayne Livesay, who organized the tractor show. The late Lewis Garrison started the tractor show at his farm and moved it to Homeplace several years ago. Attendance was dwindling, and Eddie and Wayne agreed to revive it. They were very successful, and the tractor show was and will continue to be in memory of Lewis Garrison. Thirty-six arts and crafts vendors, exhibitors, and demonstrators and eight food vendors were kept very busy as was the crowd that came to play, buy and eat. The pony rides, barrel train and hay rides were filled all day. He food vendors had little rest and the newly renovated barn, where there was continual live music all day, was crowded. ​Homeplace hosted the Adair County Garden Club March 22 for a workshop on building bat houses and learning how to attract the bats. Bats have taken a bad rap over the years but are quite beneficial. They can eat more than 1,200 mosquitoes an hour, often, consuming their body weight in insects every night. Unfortunately, in Kentucky the bat population is in serious decline due to habitat loss, pesticides and most importantly white nose syndrome, a fungal disease that has killed millions of bats in North America since it was first noticed in a single cave in New York in 2007. The loss of bats to white nose syndrome is the most precipitous wildlife collapse of the past century. ​Inexpensive bat house kits are available through Amazon and other on-line distributors or locally over counter at Ace Hardware, Tractor Supply, Walmart or other local stores. Homeplace anticipates our most active, rewarding and productive year ahead. We already have more going on and planned than ever before, and the present executive board is rapidly becoming overwhelmed. We desperately need your help. Here are a few ways you can help us make Homeplace live up to its tremendous potential as Kentucky’s Outdoor Classroom, promotor of sustained agriculture, preserver of our rural heritage and source of cultural opportunities. Here are some of the ways you can help on an on­going basis. Manage our Friends of Homeplace program: The work can be done on your own time in your home. The responsibilities will be to help promote the program and keep a record of those involved. There will be no need to collect or manage funding. Identifying grant opportunities and writing grant applications: This will require some research but can be done at your own convenience. Experience will help but is not necessary. Assistance will be available on grant preparation. Gardening/landscaping: Coordinating the upkeep of the gardens and landscaping at Homeplace. You will not be expected to do it all yourself but may need to find people to help. Wedding coordinator: Helping schedule and accommodate weddings at Homeplace. There are typically three or four weddings a year, mostly in the spring, late summer and fall. Homeplace’s responsibility is limited to facility use. Giving record keeper: Keep track of those who make monetary contributions to Homeplace and be sure they are properly thanked and recognized. You will not be asked to actively raise money but, may help if you wish. Trail Maintenance: Helping with upkeep and monitoring of the Homeplace/Tebbs Bend Nature Area trails. On-going maintenance: Either specific skills or general handy man/woman help. We have plenty of need for both. This will, of course, depend on your interests and availability as projects become available. Parking cars, greeters, children’s activities, directing traffic, monitoring trash and recycling containers, serving as guide, assist with arts/craft sellers and exhibitors, preparation of the facilities prior to and/or clean-up after events, or being there to help where ever needed. We would also like to schedule more activities throughout the year, and if you would like to sponsor a workshop, music event, trail walk, nature adventure or any other event that meets our criteria of wholesome learning, cultural or sustainable agriculture activities, let us know. You can respond to this e-mail (kolbensc@gmail) or call 270 789 0006 if you want to help or need additional information. Homeplace is fortunate to have a very early example of a log pen that was donated to the farm by Taylor County’s Gwynette and Ronnie Sullivan family. The earliest structures Kentucky settlers built along with their cabins and forts were log pens to protect their animals. The structure at Homeplace, built largely with Amercian Chestnut logs in excellent condition, is thought to be from the early 1800s. It is a fine example of these early log buildings. The log pen was taken down by Homeplace volunteers and transported to Homeplace where it has been reassembled and will eventially serve as the centerpiece in a building to house early farm equipment and an area to demonstrate early Kentucky farm implements and techniques. The first step in preserving the log pen has been completed with the construction of this pavilion. The protective pavilion was completed in June thanks to an anonymous donor who offered a $5,000 matching grant and 32 businesses and individuals who stepped-up and matched that $5,000 in just a little over one month. The next step will be to covert the pavilion in to a building suitable to display and demonstration of historic farm implements. Homeplace has assigned a high priority to funding completion of the project. ​Construction of the pavilion to protect the Log pen barn began April 26 and was completed in mid-June. For a photos of the progress of that constuction click here. The pavilion will be the foundation for a completed building housing the log pen and early farm equipment and implements, which remains a high priority as soon as funding become available. ​Below is a preliminary plan for the finished building. Thanks to these donors who helped save the log pen barn! Adair County Garden Club, Ann Hescamp Curtis, Bank of Columbia, Becky Nash Rowe, Betty Jane Gorin-Smith, Bill Coleman, Billy Joe Fudge, Bob Barnes, Cheryl Williams, Community Trust Bank, Danny Jefferies, David DeBrot, George and Vonnie Kolbenschlag, Gina Lyn Cox, Joe Creason, Ken Forman, Mark Coleman, Martha and Robert Lamkin, Martin-Grissom Funeral Home, Mary Knight, Mike Caldwell, Paul and Donna Gladdis, Red Barn Veterinarians, Stotts-Phelps-McQueary Funeral Home, Sara Sproles, Sue Stivers, Terry Hadley, Terry Hayes, Tim Darnell, United Citizens Bank and two additional anonymous donors. And to the Gwynette and Ronnie Sullivan family who donated and log pen barn and contributed funds to reconstruct it at Homeplace. In September Homeplace was selected as the site for a Conservation Innovation Grant (CIG) by the Natural Resources Conservation Service (NRCS). The main objective will be to collect data and investigate groundwater flow under, and in the area of the farm. The work will be done the University of Kentucky Geological Society in cooperation with Homeplace. Homeplace is underlain by soluble limestone bedrocks, and its landscape is characterized by a unique rolling topography known as “karst”. Here the karst is created by the presence of many shallow soil-covered sinkholes. Storm water collects in these sinkholes where it either percolates slowly into the ground, or drains quickly underground through openings in the soil and underlying bedrock known as “swallets”. The water drained underground by sinkholes flows through networks of interconnected fractures and cave-like passages in the bedrock, and then usually discharges back to the surface at a karst spring, such as the one located on the Homeplace Farm. By investigating the drainage characteristics of the sinkholes, and the flow of groundwater to the Cave Spring, the work will lay the foundation for future comprehensive water quality and soil health assessments that will evaluate the effects the effects and benefits of various cover crops strategies and best management practices employed at the Farm. The University of Kentucky Geological Society (KGS) is partnering with Homeplace to do all the research on the project, are working to map the sinkholes and springs in the area. We can use landowners’ assistance with this task. The KGS has done work to identify sinkholes in the area using high-resolution topographic data. However, maps obtained using this technique cannot identify springs, and sinkholes must be verified by field visits so the public’s assistance with this part of the study is encouraged and greatly appreciated. If you live in the Meadow Creek or Pinch Creek area, we would like to know of any springs and sinkholes, especially the ones having swallets or open throats. Once sinkhole and spring mapping work is complete KGS will begin conducting dye-tracing tests of selected sinkholes to determine groundwater flow directions in the area and to identify the collective area of sinkhole drainage that feeds water to Cave Spring on Homeplace. The dyes are brightly-colored but non- toxic to humans, animals, and plant life. KGS will be installing charcoal packets in springs and streams in the area; the packets absorb the dyes from the water and allow the KGS scientists to identify which sinkholes the dye-traced water originated at, and how far and fast it has traveled through the subsurface karst drainage networks. ​This research is very important work that will benefit not only the Homeplace farm, but all the citizens of the Campbellsville area. Groundwater is an important natural resource to our farms and families, and a better understanding of it enables us to use it more wisely and protect it more effectively. Homeplace on Green River is living up to its designation as Kentucky’s outdoor classroom. Several hundred students from Adair and Taylor counties completed field trips to the farm in to learn about the importance of farm crops, animals, woodlands and seldom seen creatures in our everyday lives. The students were divided into groups and had different “stations” to visit. Homeplace board members and other volunteers led sessions on plants, animals and insects on the farm including detailed examinations of decaying logs, tree identification, the importance of the local waters, farms and woodlands. The cost was covered in part by grants for the Taylor County students and financial support by the Adair County Farm Bureau for the Adair students. ​Students from Campbellsville Independent and Taylor County Schools as well as Lindsey Wilson College classes have also used Homeplace this year as an outdoor classroom. ​The continued use of Homeplace by Kentucky’s school systems provides an opportunity to acquaint students with the significance of agriculture in their lives and develops an appreciation of the long history of farming in the commonwealth. It will also help develop in them an appreciation of our environment. Notice: Several of the trails at Homeplace have suffered weather damage and are temporarily closed. TRAILS THAT ARE OPEN are the Cave Spring Loop, Cave Spring Access Trail and the River Bluff Trail. ​The Tebbs Bend-Green River five mile trail system is open from sunrise until sunset daily. 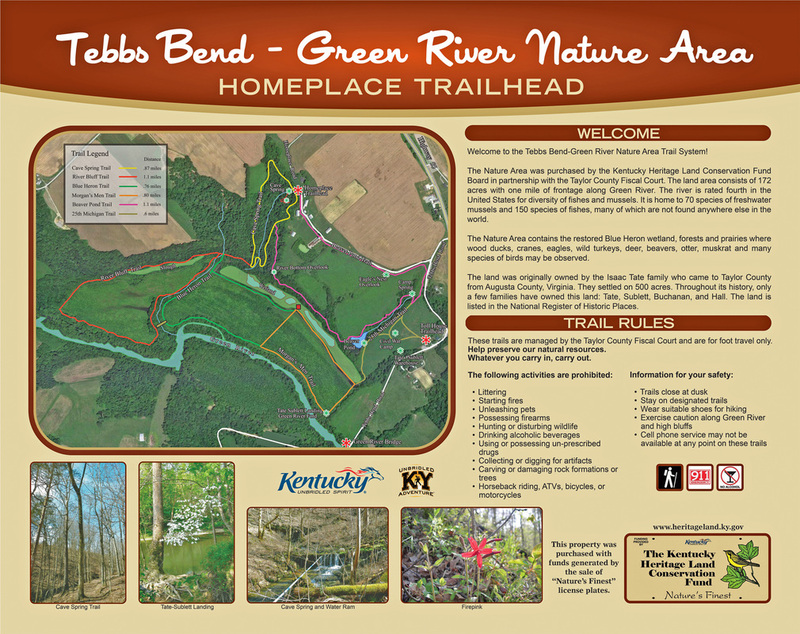 Trail heads are located at Homplace on Green River just across from the grain bins and the historic Tebbs Bend toll house on Tebbs Bend Road just before the river crossing. The 5.23 miles of interlocking trails traverse several eco-systems including the restored Blue Heron Wetlands, forests, streams and prairies where wood ducks, cranes, eagles, wild turkeys, beaver, deer, otter and many other species of animals and birds may be seen. There are cut backs that allow hikers to walk either short or long distances. Much of the trail system is level, but some is more moderate in difficulty.